The Lucas Museum of Narrative Art’s building is designed by award-winning architect Ma Yansong of MAD Architects. Chicago-based VOA is the project’s architect of record. Studio Gang Architects and SCAPE Landscape Architects are designing the landscape. 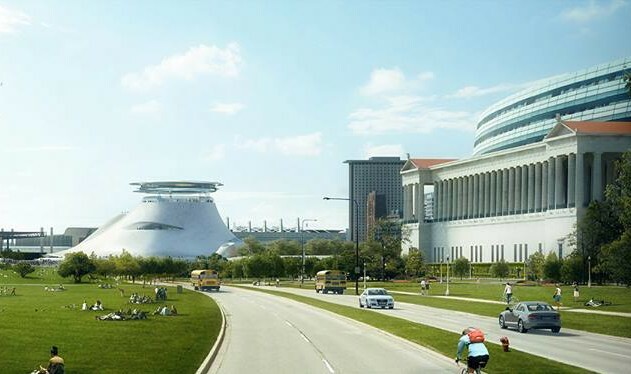 A landmark sculptural building, the Lucas Museum’s state-of-the-art facility will add to the rich legacy of architectural innovation in Chicago. Architect Ma Yansong envisions a spatial experience that responds to the lake, the cityscape and the sky. The path of visitor travel, the extraordinary shape of the building and its materials will inspire stories within the Museum. The Museum’s new green spaces, designed by Chicago-based Jeanne Gang of Studio Gang Architects and Kate Orff of SCAPE, evoke the historic topography and native vegetation of the lakeshore. This diverse and enriching park landscape replaces what was previously covered in asphalt. Distinct zones within the new park spaces provide a variety of educationally rich and inviting experiences with nature and are accessible to all park visitors. The Lucas Museum of Narrative Art is honored to stand alongside Chicago’s celebrated community of distinguished institutions on the lakeshore museum campus.